While I was standing at the functioning Reverse Osmosis (RO) Plant in Mithi after getting a tour of the area, I was struck by the vastness of the Thar landscape. I wanted to get away from all the technical talk about water and go outside to immerse myself in that great expanse. It was a sunny Friday morning. I stepped outside to stretch my legs. The blazing sun was decked high in the azure sky. The dessert land was peppered with dusty green shrubs. I saw a couple of young Thari women, clinging to each other, like a flock of birds. One of them saw me looking in their direction and they hurriedly scurried off. The Thari women feel shy in an outsider’s glaring presence. I directed my gaze elsewhere. That’s when I saw Heeru – an old woman in a colourful sari and thick white bangles. She was with her husband Rannu, whose frailty made me shudder a little. I asked my colleague, Zubair Ashraf, who spoke Dhatki, the local language, to facilitate a conversation. Heeru warmed up to me right away. Her boldness impressed me. After we had exchanged pleasantries she told me what she has to go through every day. Heeru revealed that her village is located a mile away from the RO plant. Heeru’s hair had greyed in an odd way. Silver had not seeped into her follicles. Instead the dessert sand had dyed it cinnamon. Rannu’s thick moustache looked like it had had been weaved from his wife’s hair. She, her husband and the donkey that was acquired on rent stuck out in the bland Thar canvas. The pistachio hue of her sari dulled the green of the shrubs, and my eyes that were in awe of the land could now focus on nothing but her. 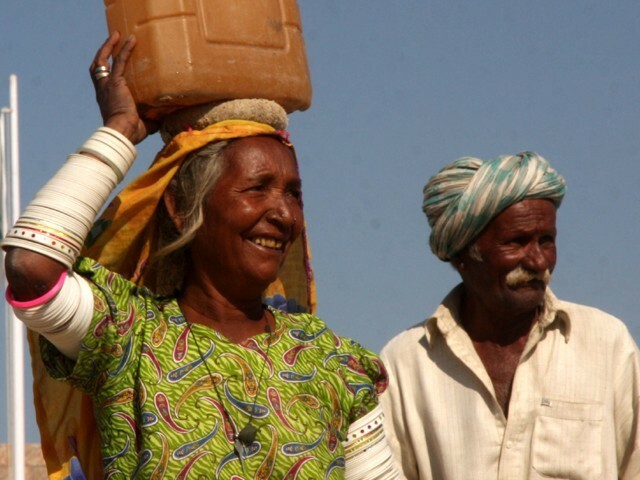 Thar has a population of 1.2 million people and a water shortage so severe that last year 600 people died from it. Women walk great distances to come to the plant to collect water. The government plans on opening up 750 plants in the area to combat the water crisis. 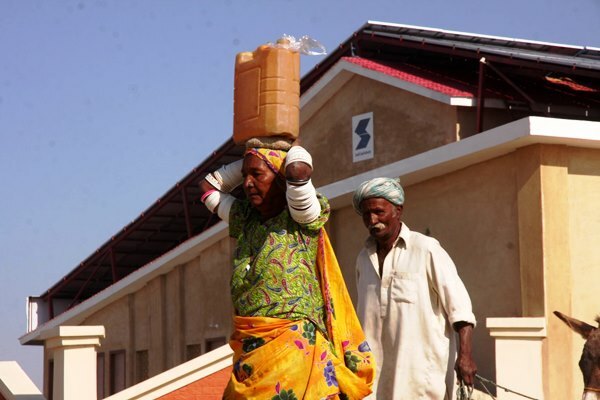 Although the Mithi plant can produce almost eight million litres of drinkable water, these plants will not effectively solve Thar’s water issues, because they are not producing enough water to sufficiently meet the needs of the people. Heeru told us that her husband had a knee problem so he couldn’t carry the water. The burden had to be borne by the mule. The feeble animal looked as if the dessert had sucked out all moisture from its body through its hooves. I asked her why most of the people queuing up for water were women. “Where are the men?” My voice disturbed the dessert air. Her mouth broke into a wide smile. The sun had dyed her teeth orange. She told me she lives in the village with her entire family. She has four children; two sons and two daughters. And more than a dozen grandchildren. “Probably 18,” she said guilelessly. My eyes traced the creases in her forehead and the wrinkles around her eyes, and I guessed that she must be over 70-years-old. “Is there no one who can help you?” I asked. “No. 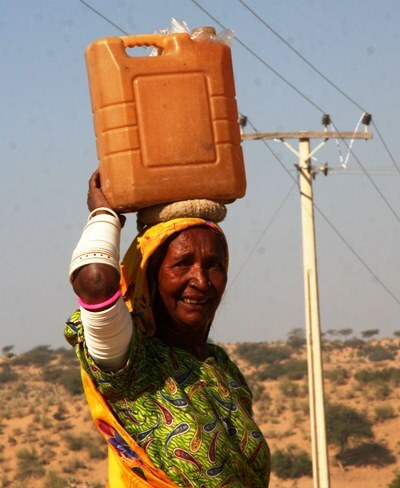 No one picks up the water bucket for me.” She adjusted the caramel coloured plastic container on her head. She chuckled. The sound of her laugh melted in my ear and stayed with me for a long time. She perked up at the mention of the city. She had been so absorbed in our conversation that she hadn’t noticed that her husband had gone off to the other end of the plant. Her eyes darted from side-to-side as she searched for him frantically. Her eyes stopped moving and rested on his face. Calm seeped into her expressions. With those words, she walked off. Her bare feet left impressions in the desert sand. The water container stood firmly on her head. I couldn’t help but be mesmerised by her gait. Her soft, but self-assured stride pierced through the picturesque landscape. She turned around and asked me if I would write about her. The writer is a staff correspondent who visited Tharparkar as part of a trip organised by Pakistan Council of Media Women. Great article. Kudos to the author. Very enlightening. Thar is a mesmerizing place. Part of the Ancient Harappan civilization. world famous ‘Dancing Girl’ statue from Mohenjo Daro. Sindh. That statue is from 2500 BC ! That would make it 4,500 years old ! the same. Through the ages.